Three of my etchings on plaster have been selected for this exhibition at the Mall Galleries, London from Wednesday 18 – Saturday 28 February 2009. Following my degree show at City and Guilds of London Art School in 1999, I was invited by Mary Fedden to use the etching studio of the late Julian Trevelyan at Durham Wharf, Hammersmith Mall. 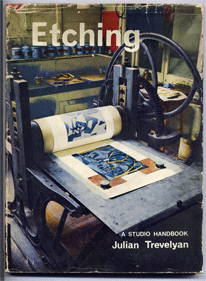 Around that time, I acquired a copy of his 1963 book Etching: Modern Methods of Intaglio Printmaking which is still the clearest writing on the subject that I have come across. He was one of the artists involved in Mass Observation. 15 x 10cm, Etching, aquatint and chine colle, 1999. 17.5 x 5.5cm, Etching and aquatint, 1999. 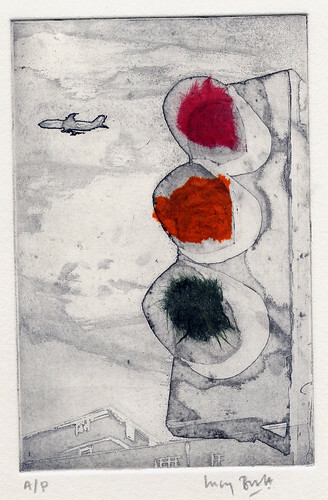 25 x 10cm, Etching and aquatint, 1999. 15.5 x 22.5cm, Etching and aquatint, A/P, 2000.